When you have customized your task list in a way that suits you best, you can save this view in the database and make it available to other InLoox users on the same database. Click on the Home tab in the Ribbon on Save, Save Current View… Now you can name the current view. You can also choose whether this view is supposed to be available to all InLoox users or only to yourself. 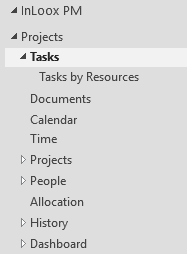 You can access the saved view in the Outlook folder pane on the left below tasks. 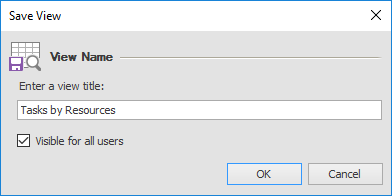 The changes you make to your default task list are saved automatically locally on your computer and are available automatically, as soon as you open the task list the next time. Save and re-use views | InLoox 9 for Outlook • Copyright 1999-2019 © InLoox, Inc. All rights reserved.